Kanda serial EEPROM programmers use ISP programming to copy, read and program serial EEPROM devices. Device supported including all 24 Series (I2C), 25 series (SPI) and 93 series (Microwire) serial EEPROMs. The EEISP-U programmer also supports AT17LVxxx and AT17Fxxx FPGA configurator EEPROMs. The software supports Xylinx files, reset polarity and other features to setup your FPGA configuration. To convert your In System Programmer into a socket programmer, Kanda supply EEPROM programming boards with different sockets. The programmers are supported by GUI version and a free DLL and command line (Console) package for integration into user software and ATE systems. 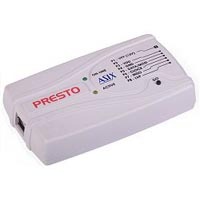 PRESTO-M programmer from Asix supports most EEPROM chips and also supports PIC and AVR microcontrollers. 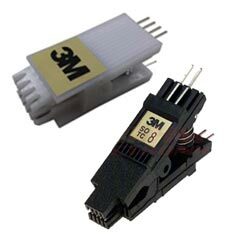 IC Test clips are available for connecting to chips in circuit so the device can be read and programmed without removing it from the board. 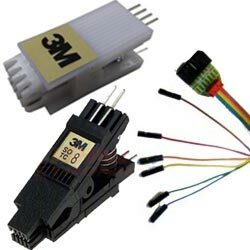 8-pin DIL and 8-pin SOIC packages are supported. 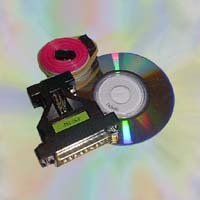 The programmer itself comes with flying leads for connecting to these test clips or to pin headers on the PCB.